Thames Foyer at The Savoy Hotel, London. For more than a quarter of a century, Heidi and I have been friends. We've welcomed each other's children into the world and consoled each other after the deaths of our parents. We've shared our hopes and our dreams, as well as our fears. We've often lived thousands of miles apart but have always felt close to each other. We started out as colleagues and ended up as friends. And it all began with afternoon tea at the Ritz in London. When Heidi recently told me that she had organized a trip to London for her English students, I booked a ticket on the Eurostar so that I could join them for tea at The Savoy on Wednesday afternoon. As the group marveled at the glass cupola of the Thames Foyer while listening to the classical music played by the hotel's resident pianist, Heidi helped everyone decide between the traditional tea with scones and clotted cream or salmon and scrambled eggs. Living up to my reputation as the "crazy American", I not-so-discretely flipped over my plate to confirm that it was Wedgwood china for Joseph the Butler and took lots of photos of the tea stands laden with dainty finger sandwiches and French pastries. Meanwhile, Heidi attempted to maintain some sense of decorum at our table of ten by not hiding her fashionable trousers under the tablecloth. One of the most important things that I've learned from Heidi is that it's always worth the effort to spend time with friends, especially if there are delectable treats at the end of the journey. And if you ever have the occasion to take the Eurostar from Paris to London for the day, do it! I decided to have Oriental Beauty Tea after our waiter told us that it's what the Queen prefers to drink in the afternoon. Official video featuring Afternoon Tea at The Savoy. I love the nothing ventured nothing gained way you go through life, Madame. You're my role model. Likewise, Madame, likewise! Whenever I feel sad that I live far away from my "old" friends, I remind myself that one of the biggest pluses of moving to a different place is that I get to make new friends like you. Thanks again for the restaurant suggestions for last night. As always, you were spot on! Oh so near and yet so far. We were at the Savoy theatre next door watching Cabaret! I agree, nothing ventured, nothing gained is a good motto, along with life's too short. 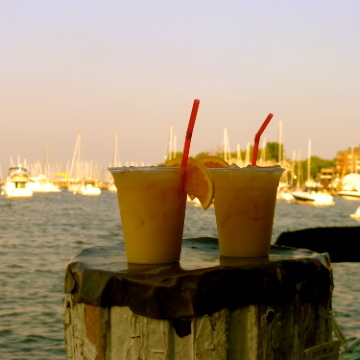 They go together...and spending time with people you love is THE most important thing in life! On that note I think I will book the Eurostar,... to Paris. I must agree with Sylvia--You exemplify "nothing ventured, nothing gained", inspirational to us all. I love that you checked the china, and I'm not surprised it was Wedgwood (without the second "e"). I also love the trays laden with treats--ten sandwiches and a variety of sizes of desserts. The tea pour photo is great too, I love the strainer, and that you caught his hand with the catch napkin--very good shot. They could do a little more with that drowning rose though, maybe just give it an extra inch or two of stem. I'm glad you got to meet up with Heidi, friends are important. You should have seen Heidi's face when I told her that I was going to embarrass her yet again by looking at the bottom of my plate. What was even more funny is that some of her students followed my example and flipped their plates over too. The next time that Heidi takes a group to London, I won't be surprised if she doesn't tell me! ;) Thanks for the heads up about Wedgwood (no second e!). I'll correct it. The two stands shown in the photos were only for our end of the table. There were three sandwich stands on the table and three pastry/cake stands. They're much more generous at the Savoy than they were at the George V because they refilled the sandwich plates and tea pots as often as we wanted. The service was excellent, as one would expect. Family and friends are always important - they're what make life worth living! Next time you'll have to go inside. Even the powder rooms at the Savoy are impressive! Show next door? Was it the Lion King? Several people from our group were thinking about getting tickets for it after we finished our tea. You and your family were in my thoughts as I walked around London, Bob, as were all the wonderful suggestions that you so readily gave us when Stephane and I were "Heathrow refugees" a couple of years ago! Since you asked about the French pastries at The Savoy, I've got to admit that they were much better at the George V in Paris. The tea, however, was better in London! 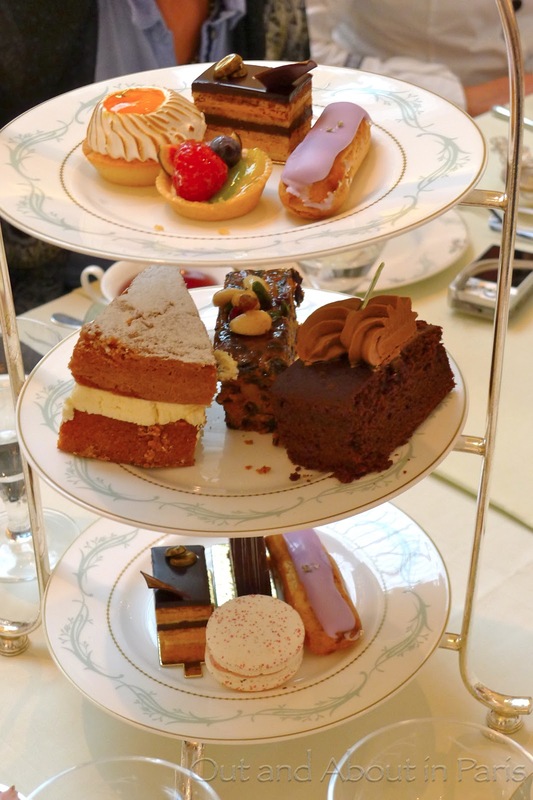 Have you ever had afternoon tea at Claridge's? That's the next place in London that I would like to go for tea. I haven't read "Down and Out ..." by George Orwell but will include it in my next Amazon order. Thanks for telling me about it. Tea at L'Espalier sounds amazing. I hope that you'll do another post about it! I still remember the one that you wrote after you went while your mom was visiting. The luxury of proximity Mark Kay. I have been bitten by the envy bug yet again! The proximity of London to Paris came as a complete surprise. I kept thinking of the days when it took long hours on the train and a rough Channel crossing to travel between the two! Seem to have lost my post.... I was saying that we were watching Cabaret next door at the Savoy theatre on that day. So near and yet so far. and, nothing ventured, nothing gained, is a good motto along with life's too short. They go together...and spending time with people you love is THE most important thing in the world. So, off to book the Eurostar!....to Paris. 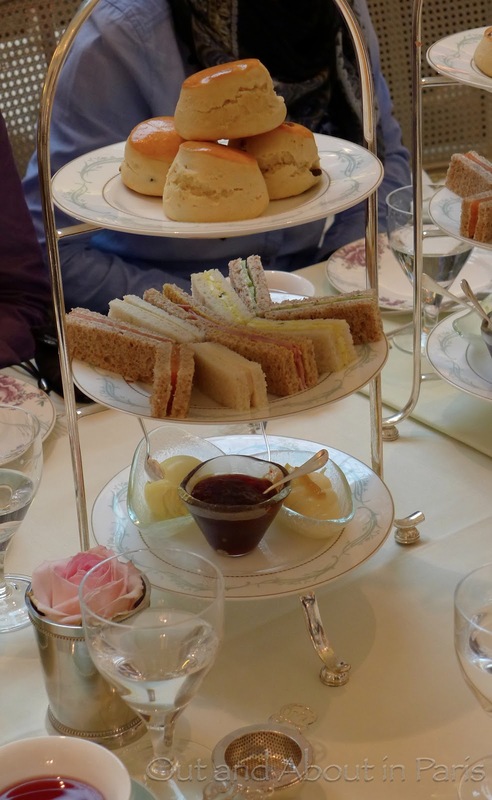 Thanks, Mary Kay, for this wonderful post of our memorable afternoon tea(s)! I'm so glad that you introduced me all those many years ago to the fascinating world of historic luxury hotels - where I'd probably not had have the courage to enter without you helping me along with your American "cheekiness"!! My students all loved meeting you and being able to use their English with you (it got a bit easier once we switched from tea to champagne)... and for me it was just great getting together with you once again - we never seem to lack in conversation topics, no matter if we're in Paris, London, Switzerland, Indonesia or anywhere else in the world. I truly appreciate your friendship! P.S. I'm not really embarassed by your "strange" actions, I'm just looking at them with amazement: how can we be so different in certain things and still be such good friends? ?